We live for accessories as our closets will attest. Accessories are like the fancy roses and fondant on an otherwise boring cake — they take your look from blah to wow and have the power to transform outfits from day to evening. 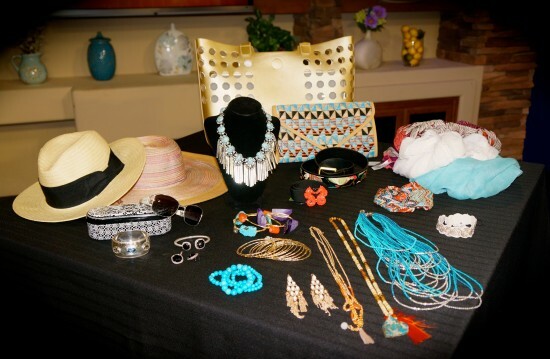 On NBC Channel 12’s Arizona Midday, Mom Style Lab’s Angela Keller featured some of the best, on-trend pieces for under $100 (!) she discovered for summer at Nordstrom, Brighton, and H&M. Special Promotion! As part of Brighton’s Sojourn in the Sun event from June 5-30, 2015, visit one of their stores to simply try on a pair of sunglasses, then enter to win a trip for two to Laguna Beach! Spend four days and three nights in one of MSL’s favorite beachside towns. Includes hotel, airfare and rental. Styles shown are from Nordstrom at Scottsdale Fashion Square, Brighton, and H&M at Scottsdale Fashion Square.